Designed for use in areas where protection from the spread of fire is required. The shutter has been tested to BS476 Part 22. Provides up to 240 minutes of protection. 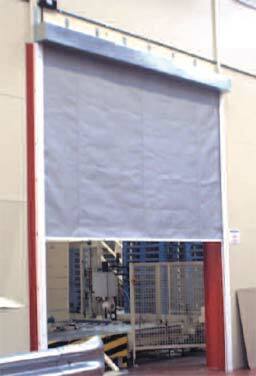 Shutter curtains are constructed from continuous interlocking galvanised steel laths (perforated lath available), securely held in place by end locks. Bottom rails are generally galvanised and roll-formed into a T-section. Vertical guides are formed from rolled steel and supplied with fixing angles suitable for securing to the structure. Prime painted mild steel of appropriate thickness relative to door size and supplied with fixing angles suitable for securing to the structure. All fire shutters as standard include a galvanised sheet steel hood (coil casing). 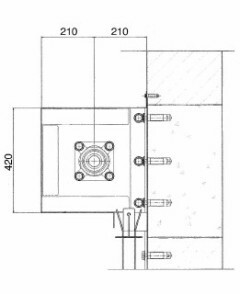 A motor cover will be included on all shutters under 2500mm high and as an option over this height. 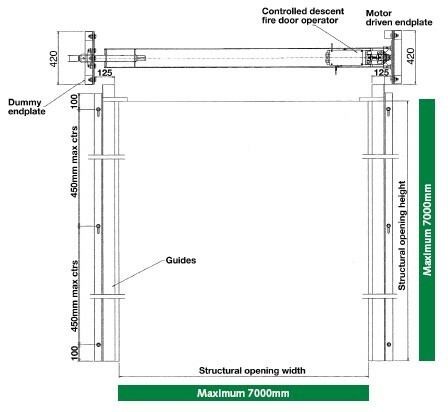 Suitable for all sizes of shutters, the motor is either single phase (240 Volt 50 Hz) or 3 phase (415 Volt 50 Hz) with controlled descent dependent on size of door. As standard each shutter will include an open/stop/close push button station mounted. 24v DC auto resetting solenoid release device connected to the fire alarm/smoke detector. Solenoid automatically resets when the shutter is fully opened by pressing the ‘up’ button and when the alarm has been turned off. 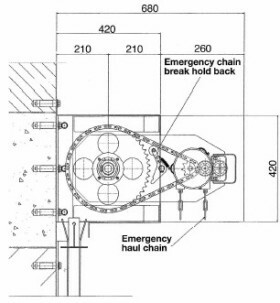 The fire alarm circuit must provide the supply for the solenoid (0.5 amps) with an initial supply of 3.5 amps for 20 – 30 m/seconds to release the shutter but only when in the alarm condition. (If the fire alarm circuit is unable to provide a 24v DC supply for the solenoid or ancillaries a battery back-up system can be provided at extra cost). Note! To comply with current legislation, fire shutters cannot be linked to fire alarm systems if they are over fire exits or cover a fire exit route. They can only be fitted with a device which will close the shutter by a local heat source i.e. fusible link.